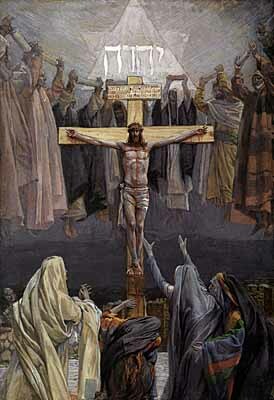 James J. Tissot, 'It Is Finished' (French painter and illustrator, 1836-1902), Brooklyn Museum, New York. As we approach Holy Week, as we begin to prepare our hearts, we meditate on the cross, and Christ's resurrection. The meaning of the resurrection is obvious! Jesus conquers death and the grave. The Father raises him and displays him to the world in all his glory. Nothing hidden. No more secrets. Now, Jesus the Prophet, the Teacher, the Healer, the Son of David, is seen in the clear light of day to be Israel's Messiah, Daniel's Son of Man,1 and the Father's Only Son -- fully divine, with a name above every name.2 The resurrection carries with it God's stamp of validation. We get the resurrection. But what about the cross? What does that mean? When we examine the heartbreaking events surrounding Jesus' crucifixion, we can become both morose and cynical. One of Jesus' inner circle betrays him for a few coins. Religious leaders who are supposed to lead people to God are deeply complicit in the death of Jesus. The status quo is too safe and the perks of power too comfortable to examine anything new that God might be saying. A Roman governor, pledged to justice under law, casually tosses out the question, "What is truth?" and then publicly washes his hands in the face of what he knows to be gross injustice. Soldiers delight in mocking the Savior and beat him half-dead with a whip tipped with bits of glass or metal designed to cut into his flesh. A crown of thorns is jammed into his scalp to poke fun at his claim to be a King. Our Lord is too weak to carry his own cross, so another must do it. They pound spikes into his wrists and feet and hoist his cross up to the sky. In thirst he cries out. In utter loneliness, he uses the words of Psalm 22 to ask why his Father has forsaken him. Within a few hours he is dead and his followers bury his body shortly thereafter. His disciples are utterly crushed. They run and hide. Yes, there are a few heroic moments -- Peter's flashing sword, Joseph of Arimathea's request for Jesus' body -- but many more moments are dastardly to the core. Many to this day see Jesus' crucifixion in the tired category of a sad but inevitable martyr's death -- injustice done, like so much injustice that is perpetrated upon reformers around the world. Jesus tried to change the system, tried valiantly, but he failed -- so they say. They see the sad and visible facts of the cross, but not the whole picture. What does the cross mean? Satan wouldn't have allowed it if he had known. He chortles to see Jesus playing right into his hands. The crucifixion is his ultimate victory. So he thinks. But it turns out he is wrong. Dead wrong. Consider this verse. Something cosmic happens on the cross. The world sees lightning and earthquakes and hours of blackness. But in the heavenly realms, something basic has changed! What exactly? It's hard to know completely this side of heaven. But it has to do with Jesus being the Lamb of God who takes away the sin of the world,3 and the Ransom given for all humankind that pays our debt in full,4 we are "bought with a price"5 -- "the precious blood of Christ. "6 All of Satan's taunting accusations against you fall before Jesus' victorious shout, "It is finished! "7 You and I are saved from our desperate pit of sin! Our sins died with Jesus on the cross. They are gone! We are forgiven! Satan has no more power over us -- legal or usurped. We are free! Hallelujah. Sometimes truth is better understood in verse than theology. Recently -- in a book long out-of-print -- I found a wonderful poem that veteran pastor Jack Hayford wrote and set to music -- one of more than 600 songs and hymns God has given him over his lifetime. Read it and rejoice. "It is finished," hear Him cry! Symbol of Christ's reign above. Driv'n before the flame of love. Death destroyed in Jesus' name. At the Cross is ev'rything. Words and music by Jack Hayford, © 1981, Rocksmith Music. ASCAP. Contained in, Jack W. Hayford (editor), Day of Thy Power: A Devotional Hymnal (Living Way Ministries, Van Nuys, 1987).